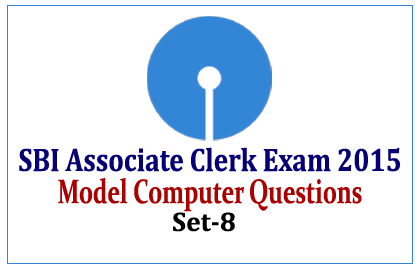 List of Model Computer Questions for the upcoming SBI Associate Clerk Exam 2015 were given below. Candidates those who are preparing for those exams can use these questions to score more marks. 1).When you switch of your computer which memory gets lost? 2).Name the program that controls the computer? 3).What is meant by Output? 4).An error is also called as______. 6).Name the device that allows you to communicate with the computer? 7).What is meant by Firmware? a) The physical component used in a computer system. b) A set of instructions through which a computer does one or more work. c) People involved in the computing process. d) A set of programs that are pre – installed in read – only memory of computer during manufacturing. b) Is common in all houses. c) Contains only a thousand microprocessors. e) Is same as the size of laptop. 9).Where is disk put in a computer? 10).Hard copy of a document________.